Deseret News photo printed 14 Jun 1980. It was the year when Mt. St. Helens blew its top and the ’empire’ struck back. The beginning of a new decade also brought with it the debut of Pac-Man, heavy metal band Iron Maiden and CNN – the first 24-hour cable news channel. In Utah, 1980 saw the grand opening of the Crossroads Plaza in downtown Salt Lake and an outdoor roller disco in Kearns. The communities of Granger, Hunter and Redwood were incorporated as West Valley City and high summer winds ripped up copper sheathing on the dome of the state capitol building. Things were changing in the amusement industry as well. The common practice of purchasing tickets to use toward individual rides was being phased out. After the pay-one-price system was implemented at Six Flags Over Texas in the ’60s, more and more parks gradually began to follow that trend. Lagoon introduced a new admission policy in 1980. It required every guest who entered the park to buy a minimum of $2 worth of tickets or buy an all-day ride pass for $8.50. Senior citizens over 60 and children under 3 were exempt from the new rule. It wasn’t the first time pay-one-price tickets were available at Lagoon. The option was advertised as early as 1968, but could have existed even earlier than that. Around 1975, all-day ride passes could be purchased for $5.75. On Sundays and Mondays the price was $4.50 (or only $3.50 if you had a special discount coupon from 7-11). A new entrance building was constructed to help manage the new ticketing system. Also new in 1980 was the Tidal Wave swinging pirate ship on Lagoon Lake, north of the Rockets. It had been about a decade since popular bands were regularly appearing at Lagoon’s Patio Gardens. Despite that fact, entertainment options were still plentiful at Lagoon. In the 1980 season, regular entertainment included bands like Cambridge playing contemporary soft rock hits on a small stage just inside the entrance. The Opera House had three different plays running for about a month each during the regular season. Of course there was also the popular Lagoon Show Band and on occasion, clowns, magicians and mimes could be found roaming the Midway. Newspaper ads announced a variety of special events throughout the season. Hi-Land Dairy sponsored a 2 for 1 date night deal on Saturday nights after 7pm. The Early Bird Bonus provided an All-Day Ride Pass for only $6 before 1:30pm. The same price was available with a Coke discount on Sundays & Mondays. Free Bingo games were held on Tuesday and Thursday nights, at least, during the regular season. 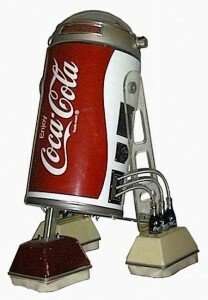 Coca-Cola sponsored a multitude of events including visits from “R2D2 – The Coca-Cola Droid”. This was a four-foot-tall robot which appeared to be a mix between the famous droid from Star Wars and a Coke can. About 275 of these were made available to Coca-Cola bottlers nationwide for promotional use at places like grocery stores, local events and the 1980 Winter Olympics in New York. Wildlife group to meet. Deseret News, 9 Feb 1980. Lagoon raises prices, but…. Deseret News, 12 Apr 1980. Lagoon to open for the season. Deseret News, 22 May 1980. Lagoon Opera House to open. Deseret News, 24 May 1980. $300 taken from Lagoon. Deseret News, 5 Aug 1980. Wiseman, K. G. Lagoon didn’t break word. Deseret News, 6 Aug 1980. Italians feast, celebrate at Lagoon. Deseret News, 11 Aug 1980. Home, mind are packed with vivid memories. Deseret News, 13 Aug 1980. Director earns Freed award. Deseret News, 27 Aug 1980. Vilmur, Pete. Have a Cobot and a Smile. StarWars.com, accessed 7 Jun 2006.